How many of us Christians have been living our lives, feeling like we've got a pretty good handle on who we are, both in the physical and the spiritual? Then, all of a sudden, a situation arises that sends you to your knees, and you feel like you have been knocked off center? It can be a reminder of something from your past, an unjust accusation, or as in my case, a family secret revealed that has you questioning even the people you thought your parents were. Whatever the case, it should be no surprise to us that the Enemy will do everything possible to stall this life of Freedom that Christ has brought us to. I have spent the last couple of weeks in a battle with my flesh, and after much spiritual introspection, I believe I have loosed the tethers that the devil used to keep my spirit tied to my flesh and this earthly realm. I hope that what I have discerned can be of value to you. In my case, I learned that the circumstances of this life do not define who I am. Yes, in the physical sense, I am a product of my parents and all that has happened to them in their lives. But this physical identity is not my TRUE identity! Whatever lies the Enemy is using to try to tell me who I am is not how Jesus identifies me. It doesn't matter what my parents might have done, or the mistakes I have made, or the accusations and judgments of others -- that is not my real identity. The Word of God says Jesus chose me and joined me to Him before He created the foundations of the world. So He knew me before He combined my mother's egg with my father's sperm and knit me in the womb. And since man wasn't formed into flesh until after the seven days of the creation of the world, it makes sense to me that Jesus knew me as a spirit. And with my rebirth into faith in Him, my spirit is now seated with Him in the Heavenly realm. Whether you agree with me or not that Jesus knew me as spirit before I was born into this flesh, it cannot be disputed that He knows my spirit now, which is in communion with the Holy Spirit here, and with Him in Heaven. Again, whatever lies the Enemy whispers to my flesh does not change who I am in the Kingdom realm. At my very core, I am not who this world says I am! Jesus declares [on my behalf] that I am a child of God; a Daughter of the King; a fellow heir of the Kingdom with Christ. I am joined to the Lord and am one spirit with Him. I am chosen, holy, and blameless before God. I am God's workmanship and I am complete in Christ. And more importantly, I am His light in this dark world. In essence, I am all the things the devil in not!!! But what does he try to do? The Enemy tries to convince us we are a product of this world -- our bloodline; our reputation; our past and present sins; the sins of our forefathers; what others think of us. We are none of those things! Our faith in Jesus has set us free from all that! Not just partially free as long as we can hang on to a sense of freedom -- but wonderfully and completely free! And our spirit lives that life of freedom when we are united with the Holy Spirit. We shouldn't use this spiritual freedom to set up a base of operations in this natural, fleshly realm. 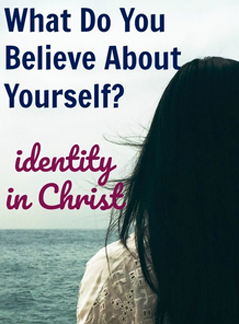 We should be living out of the spiritual realm where our new identity is. Remember, when we become joined with Christ, we are a new creation and the old order is gone. Since my flesh didn't change when I accepted Christ as my Savior, the new "thing" created was my spirit. The old order of living through my flesh was replaced with living in my spirit. But, oh how the devil tries to keep me earthbound! He throws up mirrors that reflect the darkness of my old self, or sound and light barriers that block God's voice and Light to my spirit. If I am not diligent, he will try to keep my spirit restrained within this flesh, unable to be joined with Christ's Holy Spirit and therefore subject to my human mind. Because here is what I have come to realize: The devil is afraid of us when we walk in our true spiritual identity. He wants us to think and act like a human, so he can remind us of what we were. But when we realize that our true identity is not found in these earthly circumstances, but rather, in who we are in the Kingdom realm, we shift our focus from this world and our spirit becomes engaged with Christ, and we begin to participate in His plan for our life according to the Father's will. The devil wants our lives to be impacted by our flesh; to keep us in this realm where he can influence our minds and hearts. But when we are walking in our true spirit identity, we are joined with Christ in His realm and the devil can't reach us or touch us. I know this is easier said than done, because I struggle with it often, as do most humans! But I have determined that I will set this goal for myself: to engage with my spirit and to transcend this flesh, being willing and expectant of an encounter with God and Jesus. When my spirit is working with the Holy Spirit, I will not be affected by my circumstances in this world. I will be able to remain joyful, loving, patient, at peace, kind, gentle, good, faithful and my spirit will stand in strength as I wait to engage with the realm where my spirit abides with Christ. This is my hope and my desire, and I believe the desire of my Father's heart. May it be so for you, too! 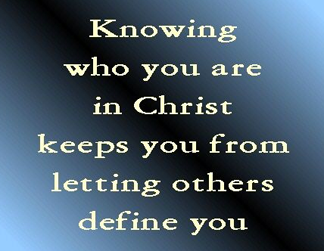 Galatians 5:17 For your flesh craves the things that offend the Holy Spirit and hinder Him from living free within you! And the Holy Spirit’s intense cravings hinder your old flesh from dominating you! So then, the two incompatible and conflicting forces within you are your [self-life of the] flesh and the new creation life of the Spirit. Pam, a friend bought me the book of Enoch, the book of jubilees and of jasher. In the book of jubilees, chapt. 12:20, it reads, 'Deliver me from the hands of evil spirits who have sway over the thoughts of men's hearts.' I have meditated for years upon the verse which Solomon wrote, 'catch the foxes for us. The little foxes that are spoiling the vineyard.' When I found that verse from Jubilees, then Solomon's prayer about the foxes began to make much more sense to me. The battleground for our souls is in the mind and which thoughts we choose to believe , (whether the words of Jesus, 'the words I speak to you are spirit and life' or flesh/sense words of this world, 'so you must think you're better than everybody else. That's just pride!'). The evil spirits who speak into our minds those thoughts to try to get us to focus on the things of this world, such as, lust of the flesh/eyes or boastful pride of life always seem to operate within the five senses of the body. Seeing, hearing, smelling, tasting and touching. The Spirit senses are operative also but the choice of engagement of the mind is dependent upon the denial of our flesh and its sense organs and deciding on Spirit senses instead. Wow, Pam, I thought this was going to be a short and sweet comment but it appears that I have opened up a can of worms that one of your full length papers is going to need to clarify this to straighten it all out!!!??!! LOL, and I hope this is taken as a joyful exercise in digging deeper into rightly dividing the word of God. I am blessed by you and your ministry and I love to read the revelations of the spirit which He gives you. It's always food for thought and I thank you for that.